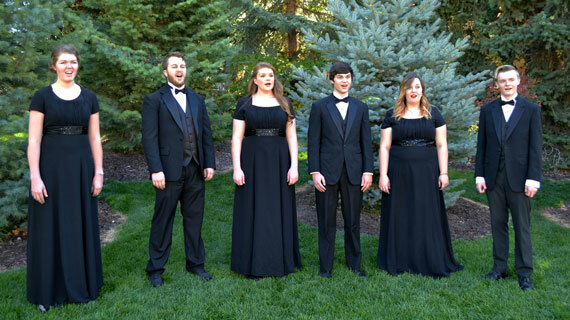 The Great American Songbook Series continues on Tuesday, December 5, 2017, in the Southern Utah Museum of Art (SUMA) at 7:30 p.m. with SUU’s Department of Music students and faculty performing the songs of Rodgers and Hammerstein. Ticket prices are $10 for adults and $5 for student. Oscar Hammerstein II came from a long line of theatrical greats. Both of his grandfathers, Horace Greeley and Oscar I, his father, William, and uncle, Arthur, worked in one way or another to promote or run artistic outlets. Hammerstein began his work in the theatre as an assistant stage manager for his uncle. His greatest success as a lyricist and librettist came when he partnered with Richard Rodgers with Broadway musicals such as Oklahoma, The King and I, South Pacific, and The Sound of Music. Hammerstein died of stomach cancer in 1960. He was named the “man who owned Broadway”. Hammerstein was honored with a global centennial celebration in 1995 and a PBS special titled “Some Enchanted Evening”. The proceeds from this concert series will be used as a fund to assist students with instrument repair and contribute to student travel for conferences throughout the year. This will relieve a portion of the financial requirement that faces students studying music. Upcoming Great American Songbook Series concerts scheduled for the 2017-2018 school year include Tuesday, February 13, 2017, featuring songs by Johnny Mercer and Tuesday, March 27, 2017, featuring the music of Harold Arlen. Enjoy the Broadway classics of Rodgers and Hammerstein this holiday season. For more information about the Department of Music at SUU, please visit www.suu.edu/pva/music.